A Raleigh Wayfarer by one of the boats moored in Bristol docks. Not a particularly interesting bike of itself, but the frame was the spit of the Hero Hawk I had in India. That's because they both could have come from the same design stable. I worked for Raleigh for a short period in 1974 (in the days when Raleigh acually made bikes in the UK). 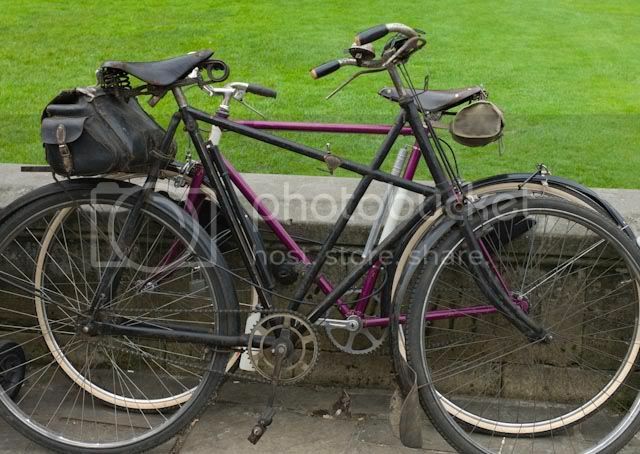 In those days, not only did the factories turn out Raleigh and Carlton bikes, but also made under labels such as Rudge, Humber, BSA, and lots of private label (Halfords may have been one - if I remember correctly). They also had licencing arrangements for other manufacturers to produce their designs overseas. I used to have some Hero transfers which I picked up at the Raleigh factory - I suspect there may have been some form of link up. I'm pretty sure it is the same design under a different name. BSA, Philips and TI are names still produced in India, though Raleigh is not. In fact I know someone there who went to the trouble of importing a (modern) Raleigh from South Africa. Phillips, Hercules, Armstrong, Rudge-Whitworth, Norman and Sun were other names coming out of the Nottingham factories (many were for export only - e.g. 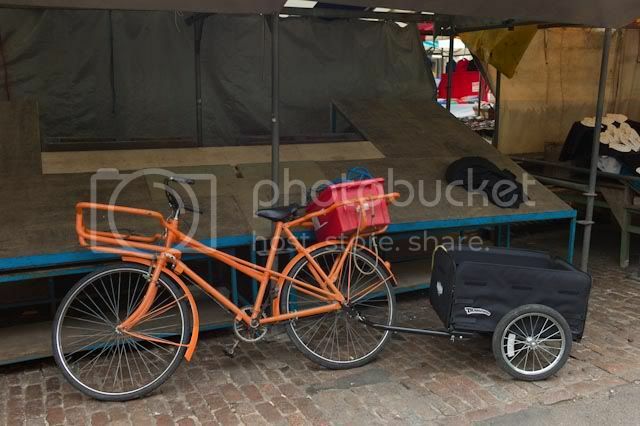 they were making butchers bikes for export to Africa, which were designed to be loaded and pushed, rather than ridden!). At that time Raleigh was owned by TI (Tube Investments). TI also owned companies such as Reynolds Tube, Sturmey Archer and J. B. Brookes (Antler luggage and Brooks saddles). Raleigh moved out of TI stable in 1987. The demise of Raleigh as a manufacturer was probably largely instigated by a disastrous project to computerise their production control systems (possibly something to do with a management consultant not understanding the Garbage In, Garbage Out principle). TI itself is now a subsiduary of Smiths Industries. In the 60s and 70s it was a major British based engineering multinanional. It seemed to have its fingers in just about everything and anything which used tubing from specialist hydraulic components, car exhausts, and stepped golf club shafts to central heating boilers and electric kettles taking in machine tools, steel works, aluminium smelting and coffin furniture on the way. Hercules is another big name in India. Friday night around 9:25, saw a bike and trailer combination lit up like a gypsy bride's wedding dress. I was at least fifty yards away, so didn't really get to see the bike, but he had at least three very bright lights on the front and a head torch and two long strips of red flashing lights on the rear. An Ordinary in the local deer park (Bradgate Park Leicestershire). Disappointingly the rider was not wearing tweeds but a high vis top. And today I saw a Hercules! Chained to some railings round the corner from Sustrans office and the Cathedral, looked like a 60s bike in good nick. 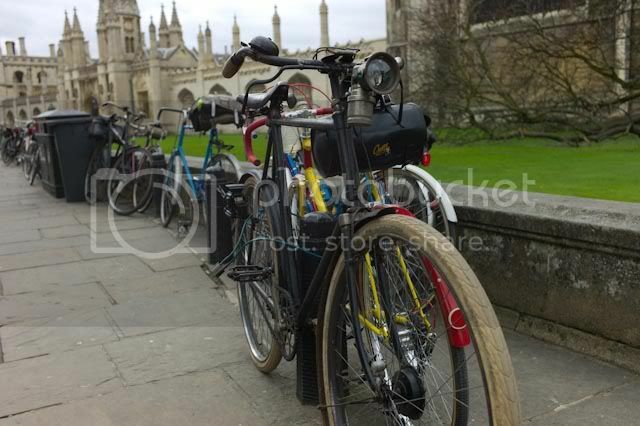 some kind of vintage/old bike run in cambridge this morning, with a fine collection of elderly bikes. I was a bit disappointed when they parked their bikes on Kings Parade then went into one of the many the Cafe Neros instead of the small independent coffee shop next door. Sounds like the Veteran-Cycle Club, probably the Cambridge Section's Cycle Paths and Architecture ride. Today my eye was caught by the name ORŁOWSKI in bold capitals on what turned out to be a fixie with those funny narrow flat-but-slightly-bent-back bars that are trendy at the moment. A bit of googling has found that Jacek Orłowski is the only custom bike frame builder in Poland, and he even has a blog in English! In the bicycle park at work today I noticed a Kirk Revolution. Those are the pressed magnesium frames from around 1987-ish? Weren't they supposed to have a great ride but dreadful corrosion problems? Someone of knee fame, yes? Anyone know what the trailer is on that one - looks like just what I need. Has anyone actually seen it out and about? 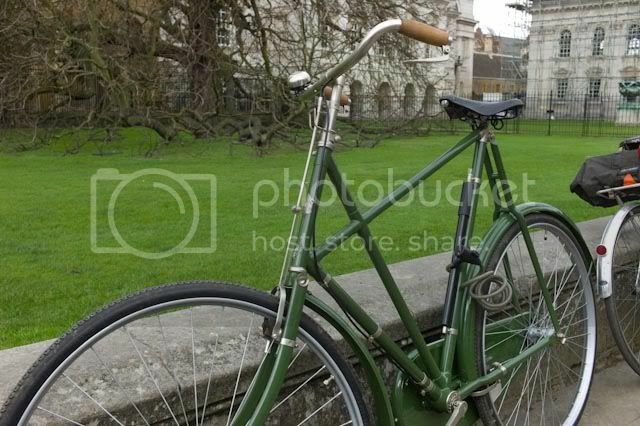 It was ridden by he-of-the-bandaged-knee on an ACF London Xmas ride a few years back. Today in the bike park at work I saw a Pederson. Your bike park seems to be an interesting place! About 5 o'clock this afternoon in front of the university and museum, a tall bike consisting of a white mountain bike frame welded or otherwise joined on top of a black mountain bike frame. There was an additional chain running down the right 'seat tube' from cranks with pedals to cranks with drive (wll, obviously). Rider showed some skillful track stands in the traffic and a woman pedestrian whipped out her phone to take a photo.